Legend has it a humble cake overthrew the Mongolian empire and began a new era in China. Like many ancient customs the mooncake is a celebrated part of Chinese culture for thousands of years with its own interesting tale of how it became a delectable fixture on the Chinese palette. Our correspondent Marc Checkley digests the past and the present of the Zhong Qiu Jie or Mid-Autumn Festival. Chinese folklore is rich with stories of our lunar neighbour. The most popular, the Moon Princess, dates from around 2000 B.C. In the legend a beautiful yet curious noble woman known as Chang-Er is banished to the moon after swallowing an elixir of immortality given to her husband, the famed archer Hou Yi, who shot down nine of 10 suns that scorched the Earth. There she dwells in sorrow, accompanied only by a white rabbit. On the 15th night of the eighth lunar month, when the moon is at its brightest, the princess's beauty once again shines down upon us all. This beloved tale is the precursor to one of China's oldest and most celebrated traditions, the Mooncake Festival. Begun during the Tang Dynasty (618-907 A.D), the festival marks the beginning of the harvest and the storing of food for the coming winter months. It is a time to celebrate and be thankful for one's family and bounty. 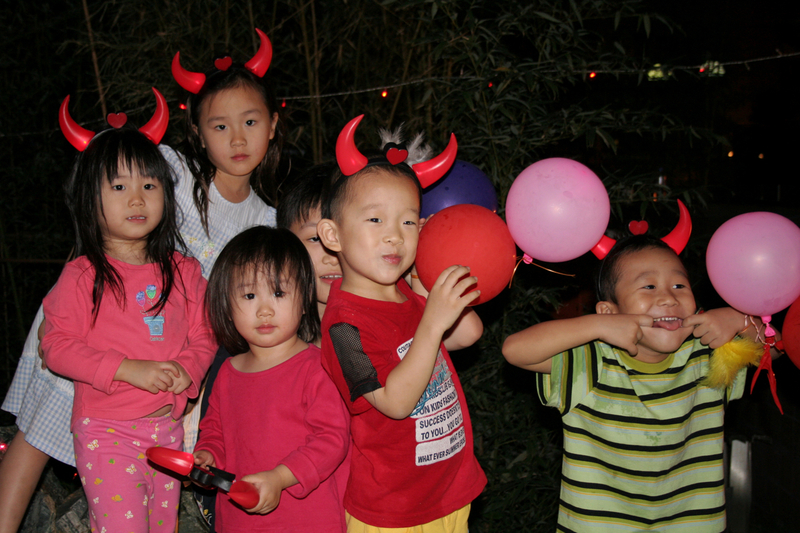 Children are told the story of Hou-Yi and Chang-Er, and carry around paper lanterns around the streets at night. What makes the festival unique is the mooncake - it's the Chinese equivalent of Easter and chocolate eggs. Mooncakes were said to be the fulcrum in a revolution that brought the end of the Yuan Dynasty (1279-1368 A.D). During that period the Middle Kingdom was under the reign of the Mongolians. A Han Chinese rebel named Zhu Yuanzhang sought to overthrow the foreign tyranny and devised a plan to bandy his countrymen to battle. He sought permission from the Mongol leaders to give round cakes in honour of Toghon Temur the 15th emperor. And in the weeks before the Mid-Autumn Festival, Zhu had the pastries delivered to neighbouring villages. Inside each cake, unknown to the Mongols who refused to eat 'local' food, was a piece of paper with the date the Hans were to launch their rebellion. On the night of the brightest moon the Chinese rebels successfully attacked and overthrew the Mongolian army. Following their victory, Zhu Yuanzhang declared himself emperor and in doing so established the Ming Dynasty (1368-1644). Henceforth, mooncakes are given and eaten by Chinese families to commemorate this legend. 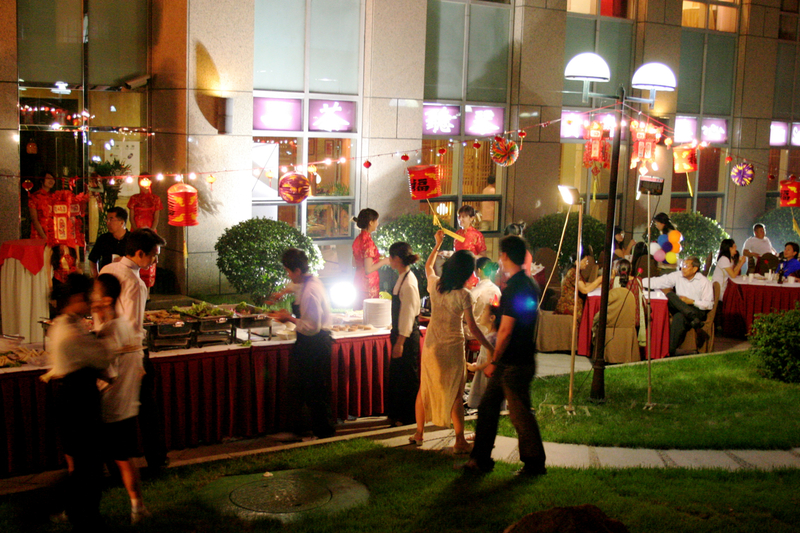 Residents of The Ascott Beijing Service Residence joined together for a Mid-Autumn banquet, Sept. 22, 2007. Photo by Marc Checkley. "The Mid-Autumn festival is as important as Chinese New Year," says Jenny Leung, Marketing Assistant Supervisor at Maxim's Caterers Ltd.in Hong Kong. "People will get together, enjoy a great dinner and share mooncakes under the moonlight with beautiful lanterns hanging around." Maxim's, who offer more than 40 varieties of the dessert, have won best mooncake inHong Kongfor nine consecutive years. Their cakes are sold the world over and begin filling shelves in June of each year.